Unboxing a new device | 22 Point Blog! « Comparison of Tablet vs phone for large print. Performing a factory reset on your device erases all the data, apps and other information you have put on the device or downloaded, and returns the phone to the same state as if you had just unboxed it for the first time. The two exceptions to this are that it does not delete data off your external Micro SD card (if your device has one), and it does not reverse any system updates to the operating system itself. So if your phone initially came with Android 4.2 on it, and it has since received updates to Android 5.0, then doing a factory reset will make the phone the same as if you had just bought it from the shop but it had Android 5.0 on it. – If you are giving or selling the phone to someone else. – If you want to delete everything and start again on your phone (remember again that this won’t reverse any system updates. If you received a system update you wish to reverse, the only way is to root your phone and either install a factory image of an earlier Android version for your phone, or install a custom ROM. 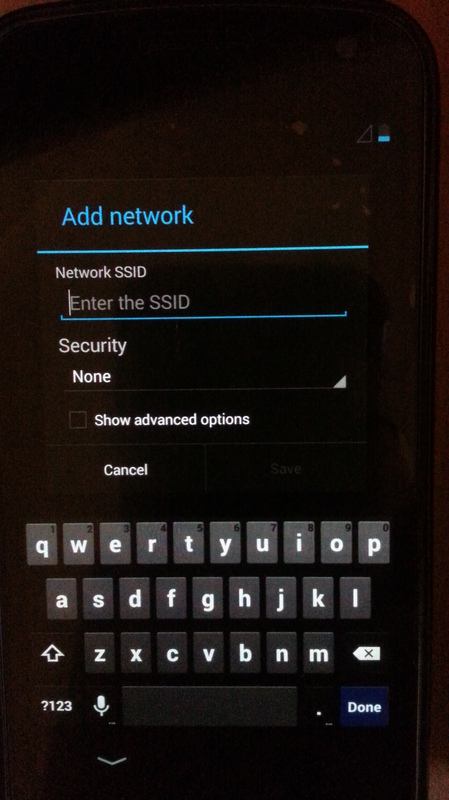 See my articles on installing a custom ROM for the steps and information about doing this). Note also, that like everyone else on the Internet, I won’t be held responsible for you deleting everything on your phone, you do that at your own risk. The main precaution to take, as well as backing everything up, is to make sure your phone has a good amount of charge, I’d say at least 50%. I’ve factory reset a couple of devices a number of times without incident, but if the phone were to suddenly go flat in the middle of the operation, there is a chance of “bricking” your device (that is, making it unuseable). 1) Make sure you have all your data backed up, this includes your photos, recordings, notes, game high scores, list of apps, layout of apps everything! Not all of that can be backed up as such – eg depending on your launcher, some do have an option to backup your list of screens and location of items, but others don’t, so you may need to make a note of that manually. Often game high scores can’t be backed up though achievements on services like Google Play Games will remain recorded. 2) Go back and make sure you backed up everything in step 1! Even though Google+ offers to automatically back up your photos, it’s still a good idea to physically copy them to your computer, just in case, or at least your SD card. 3) Slide down with one finger to open the notification shade. 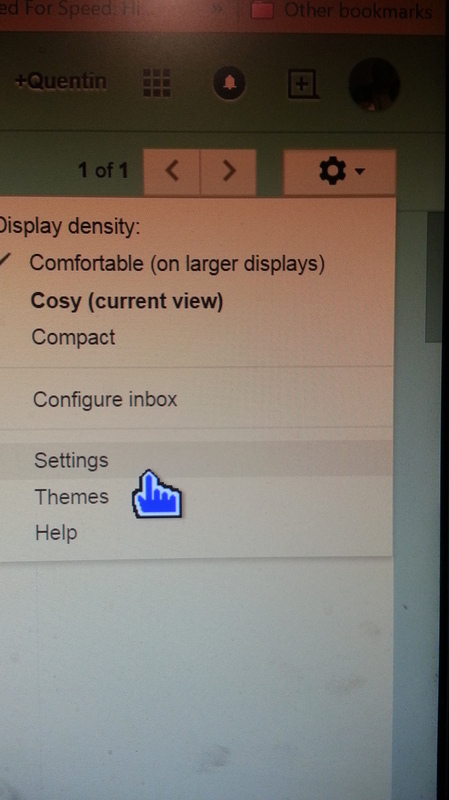 On some devices the settings button (looks like a cog) is up the top right. On others, you may need to either press the “Quick Settings” button on the top right, or alternatively instead of swiping with one finger, swipe down with two fingers to open this screen directly. If you are using Talkback screen reader, then add an extra finger (swipe down with two fingers to open notification shade, or two fingers to open quick settings screen). 4) Locate the Settings button up near the top right and tap it (double tap with Talkback). 5) Some devices have all the settings in one long list, and some divide them into sections. If you have a device which divides the settings into sections, what we want will be in the Device section, otherwise it will be just over halfway down the list and called something like “Backup and Reset” (yours may vary of course!). Select that option. 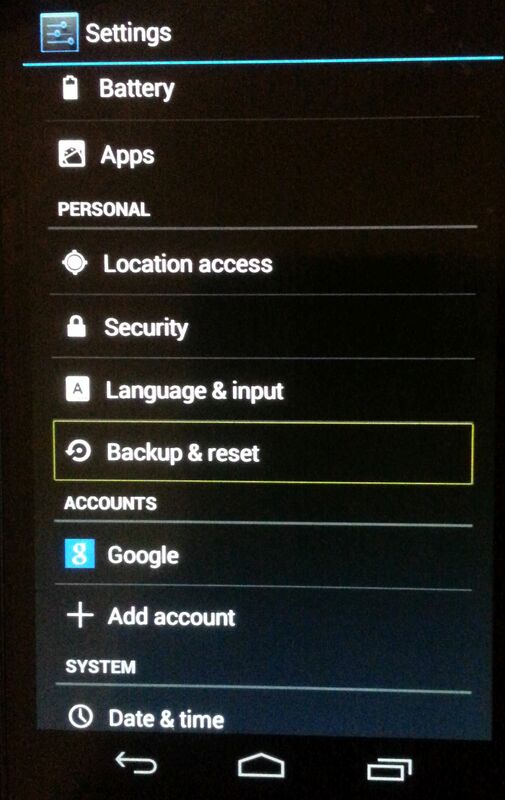 6) The Backup and Reset screen has options for how your data is backed up, the account to back up and whether to automatically restore data when you reinstall a backed up app. Now I must admit, I’ve factory reset several phones a number of times and I’m not sure if it’s because I have more than one phone linked to my account or something else I’m doing, but I’ve found that sometimes when I do a factory reset, it restores the apps I had on previously, and sometimes it doesn’t. Out of the last half dozen times I’ve done it, once it didn’t restore anything, once it restored the data from one of my other phones (the apps were different), once it restored an older copy of the apps (as in, some were there I’d uninstalled a few weeks ago etc) and the other times it has correctly restored the right apps. I’ve never actually had it reinstall the data that came with an app (eg game high scores, notes from a notes app etc) so I’m not sure what the conditions for that “Restore backed up settings and data” option are. 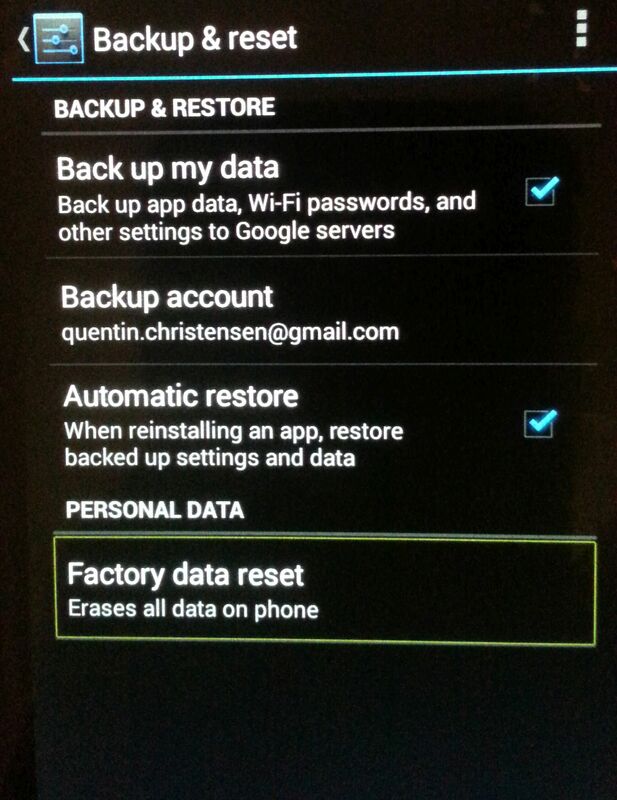 7) Choose the “Factory data reset” option. 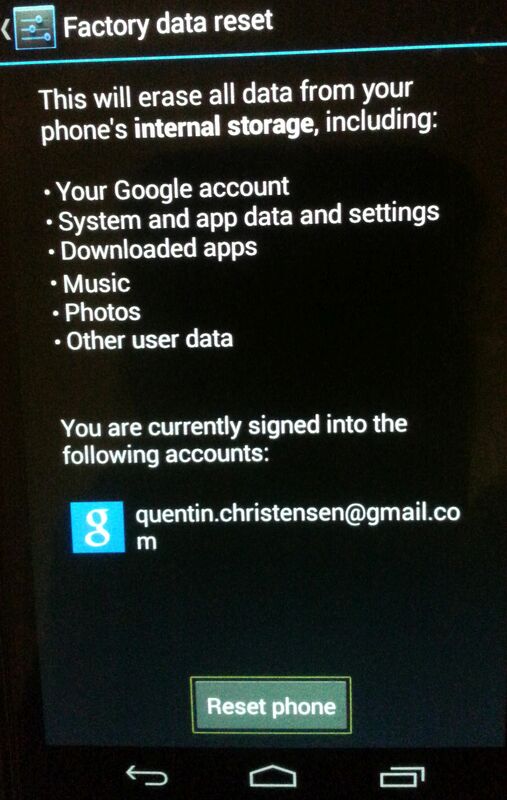 8) This takes you to a screen warning you that it will erase everything from your phone’s internal storage, including, Your Google account, System and app data and settings, Downloaded apps, Music, Photos and other user data and reminding you which accounts you are currently signed into. If you wish to continue, press the “Reset Phone” button. 9) You are given one final chance to back out, on a screen which asks you if you want to erase all your personal information and downloaded apps and warning that you cannot reverse this action. 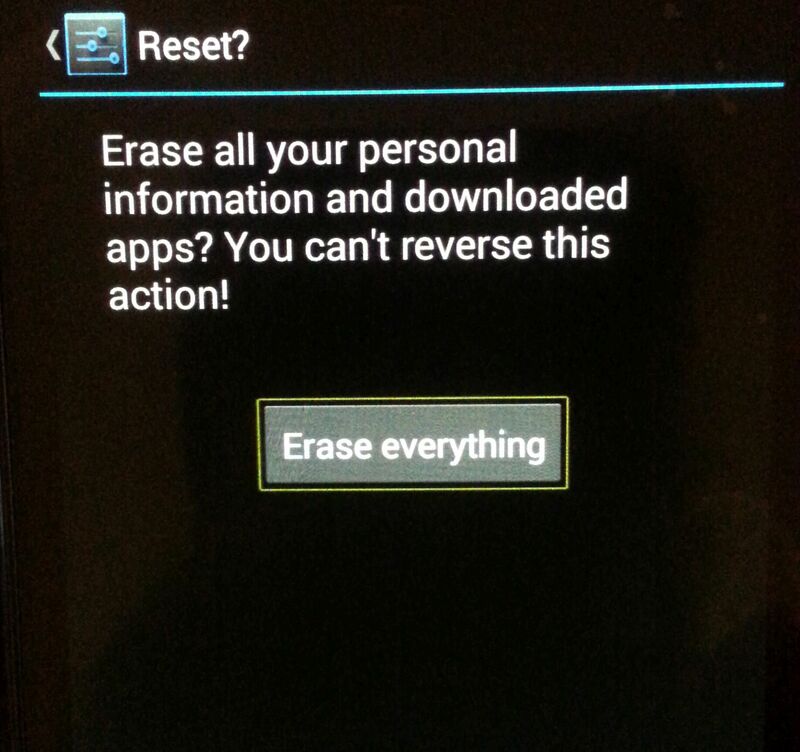 10) If you wish to reset the phone, press the “Erase everything” button. 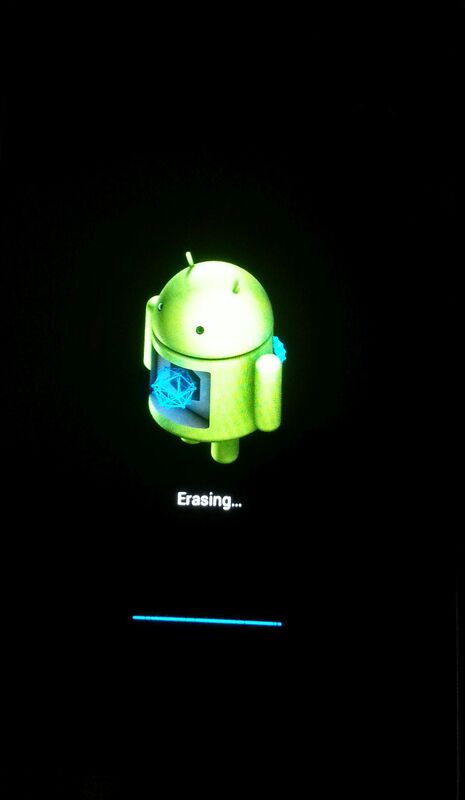 11) The phone reboots, initially showing simply the word “Google” on screen, then changing to a screen with an image of an Android with its back open and the text “Erasing” underneath with a minimal blue progress bar. Then the phone reboots again, and it is as if you were unboxing the phone for the first time. (Move to the next section). When you get your new device, the first thing to do is to double check that you have everything that you paid for! The next step (or perhaps, before that if you are impatient – but it really would be better to find out something was missing NOW before you throw the packaging away than in a couple of days and have to go hunting through the bin), is to turn it on and start playing with it. You do need to go through a couple of setup screens first and I thought I’d present them here so you can get an idea of what you are in for. 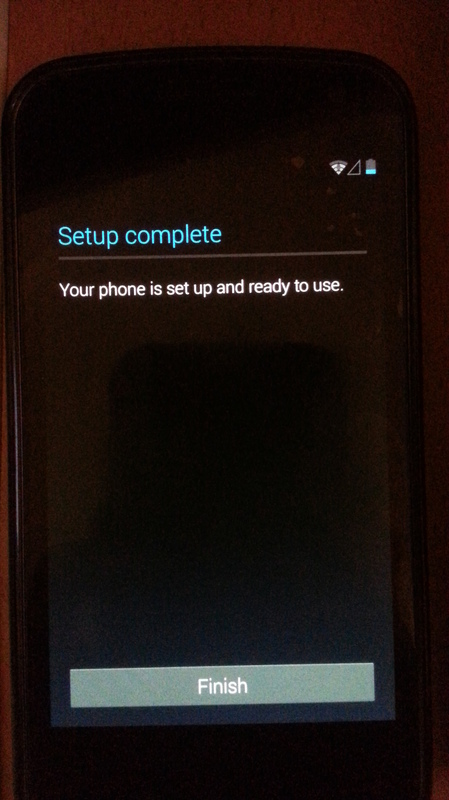 Now the process varies from device to device and manufacturer to manufacturer, but what I’m going through here are the steps for a 2012 model Galaxy Nexus phone – even though it’s made by Samsung, because it has the Nexus branding, it’s running the ‘pure’ vanilla Android as it comes from Google. Essentially this is what the other manufacturers (including Samsung for their own branded devices) start with, and they then tinker to make it suit both their hardware and their own ideas of how the phone or tablet should be setup and what options should be available. 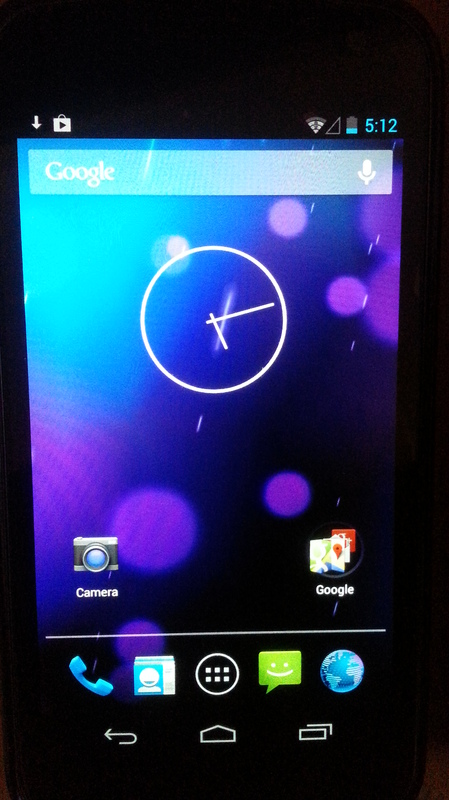 Being a Nexus, it’s also got most of the updates and is running Android 4.3. Even though Android 5 is out, most of the devices currently available in stores are still running versions of Android anywhere from 4.1 up to 4.4. 1) Turn it on! This does involve finding the power button, and as I’m trying to make this as generic as possible, I don’t know where it will be on your device. On mine, it’s on the right hand edge, on some it’s on the top, but in any case, it will be a hardware button, even if the others are not. 2) Wait! When you turn the device on for the first time, you will initially see the “Google” logo, or possibly the name of your specific device. Then you will see the boot animation, this will vary from device to device. 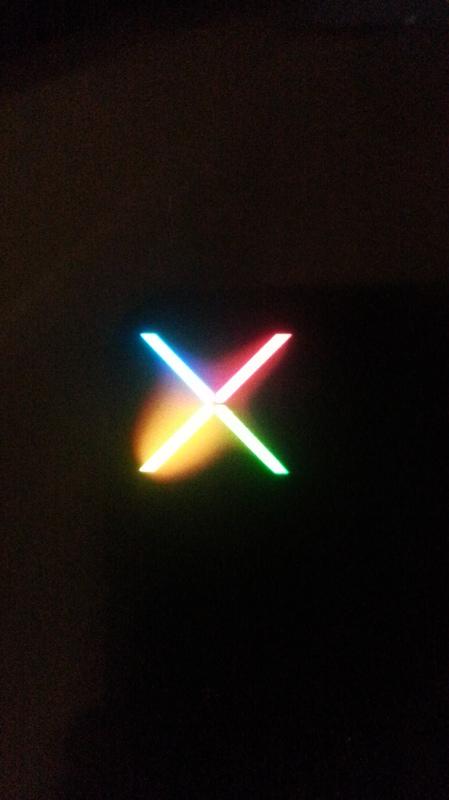 For my Nexus, it has an “X” with each arm being in a different colour (red, green, blue and yellow) and they alternately pulse brighter. There is no “progress bar”, but this first boot will take longer than usual. 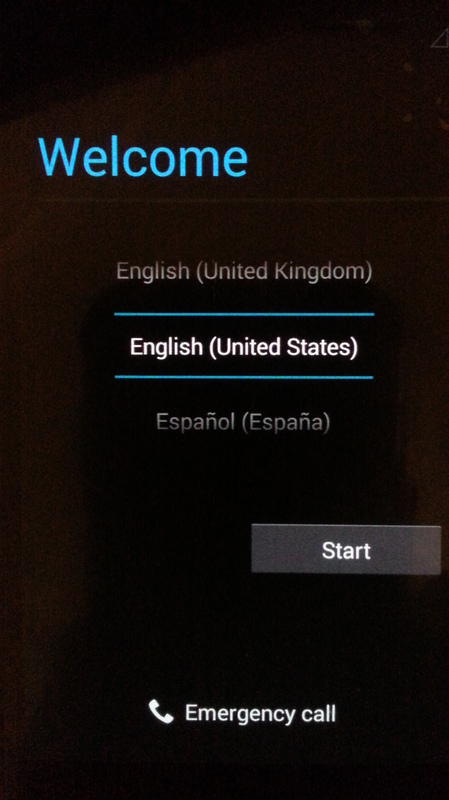 3) Eventually, a “Welcome” screen will appear, asking which language you want to use. At this point, if you wish to have speech, hold down two fingers on the screen, slightly apart, for about 10 seconds. A voice will announce to keep holding down two fingers to turn accessibility on. 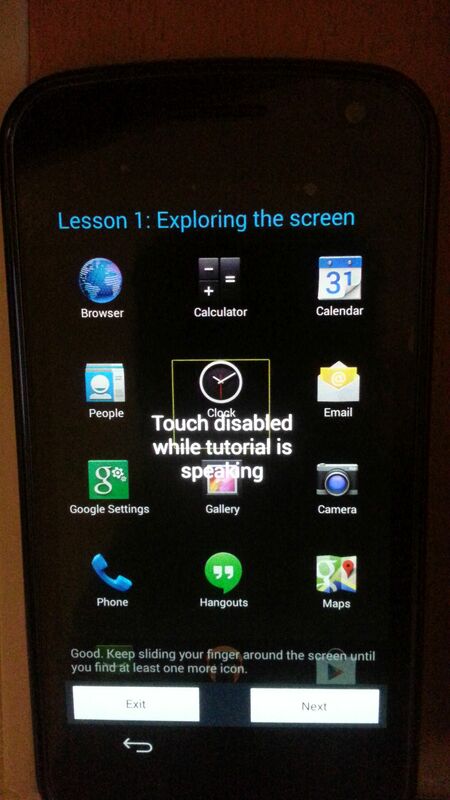 Then the device will beep and launch the “Explore by touch” tutorial, which will guide you through the basics of getting around the device using Talkback. If your phone is running an older version of Android (This was introduced as standard in 4.1 but it’s possible some manufacturers may have disabled it, in which case, you’ll need sighted assistance if you can’t see the text or use a physical magnifier). 4) On the welcome screen, the default language selected will be based on the local language for where the device was originally intended. If you buy the phone at a reputable local dealer, this should be your default language, but if you buy the phone online or through a “Grey market” importer, it may be setup differently. I bought a phone online once and even though I’m in Australia, the phone was originally intended for the Belgium market and came to this screen offering French by default. In any case, to change language, swipe up or down with one finger (two if using Talkback) and choose the language you wish to use. 5) Press “Start” (or Next). 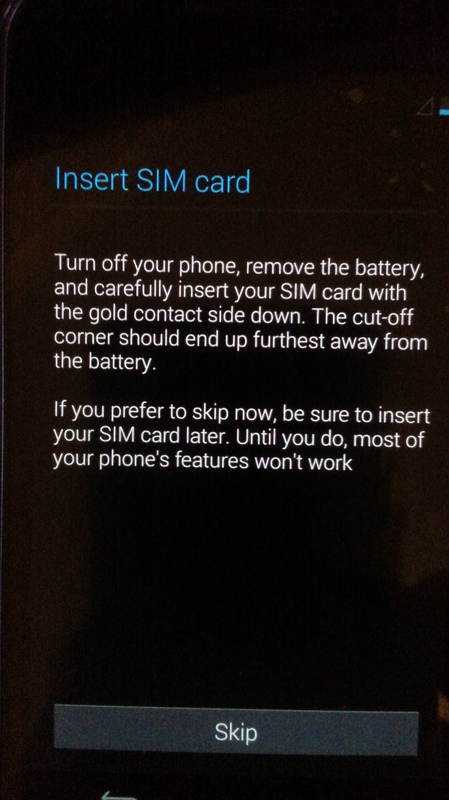 Because the phone I’m using for this walkthrough is not my main phone, I don’t have a SIM card in it, so at this point I’ve got a warning telling me I should turn the phone off and put a SIM card in otherwise I won’t be able to use most of the phone features. If you are using a phone and it has the SIM card in it already – either pre-installed by the carrier, or by yourself, then you won’t see this, similarly you won’t see it if you are using a tablet which doesn’t take a SIM card (some do, which enables them to access 3G / 4G data as well as Wi-Fi). 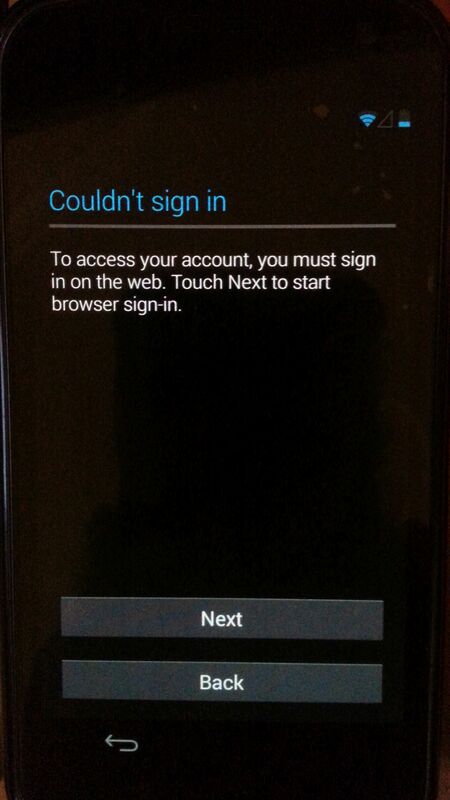 Anyway, if you get this screen, either turn your phone off and insert a SIM card, or press “Skip”. 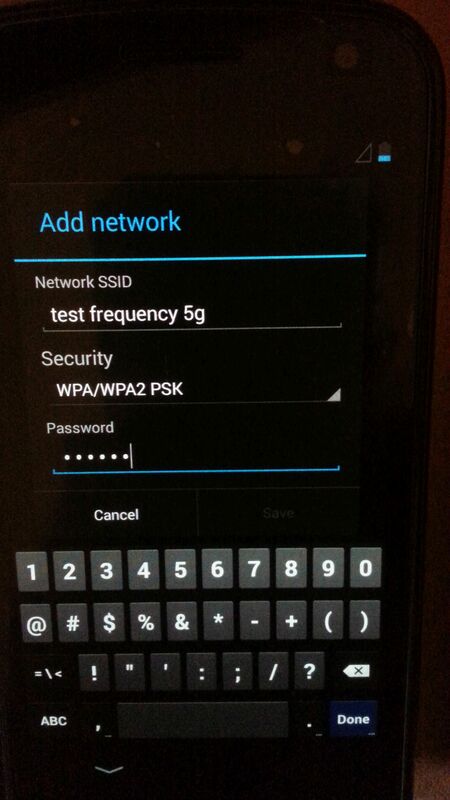 6) Next you are asked to select a Wi-Fi network. If you have one, it’s a good idea to set it up now, as any system updates or app downloading can then be done over Wi-Fi rather than using 3G / 4G (if your device has a SIM card). 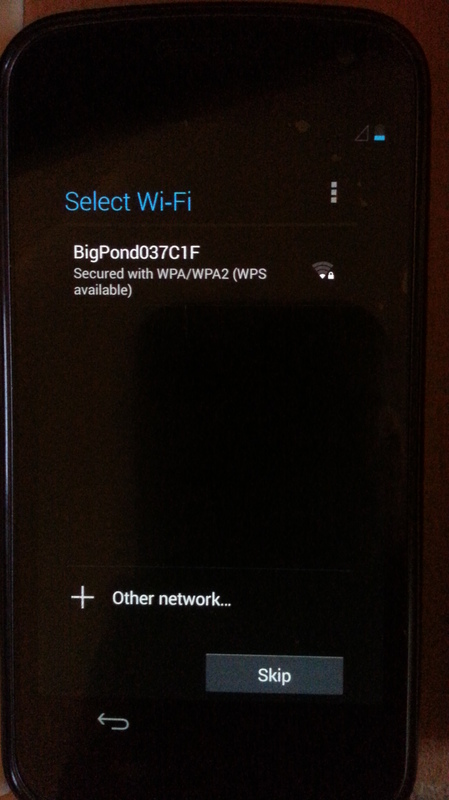 Generally it should appear in the list, but if it doesn’t (mine for instance is hidden from view so you have to know it exists and know it’s SSID or name), then you can press the “+ Other network” and add the details in manually. 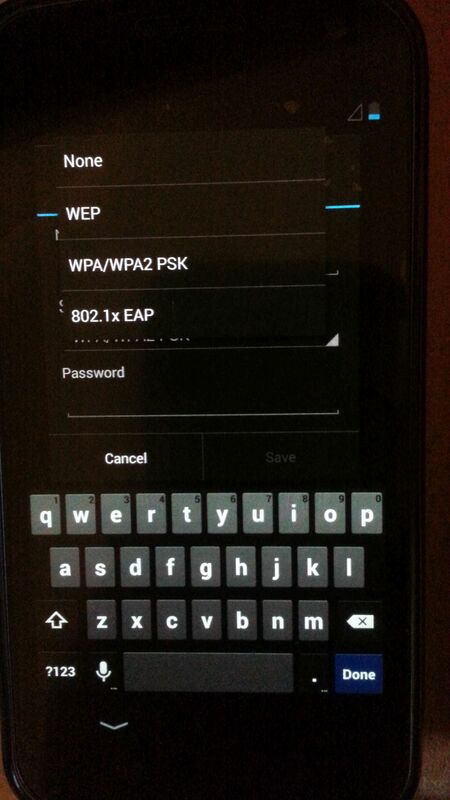 (SSID, security type and password). You should have security on your network and have a password. If you don’t then talk to whoever set your network up, as unsecured networks are very risky. 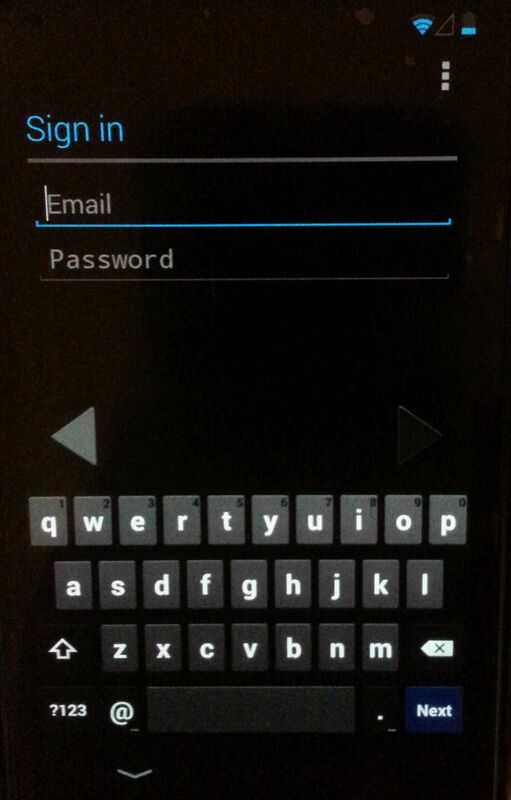 To type in the information, you are presented with a keyboard which takes up the bottom third of the screen. This is laid out similar to a qwerty keyboard, so if you are familiar with a computer keyboard, this will be similar, albeit smaller. If you are using Talkback, it will announce each letter as you drag your finger across the keyboard, and enter the current letter (or symbol) when you release your finger. The keyboard will be customised to your current language settings, so if you select English UK as your language for instance, one of the symbols on the number page is a Pound Sterling symbol. If you selected English US, the symbol in that place will be a dollar sign. If you use a non-English language then the keyboard may have letters and symbols to suit that (eg accented characters). 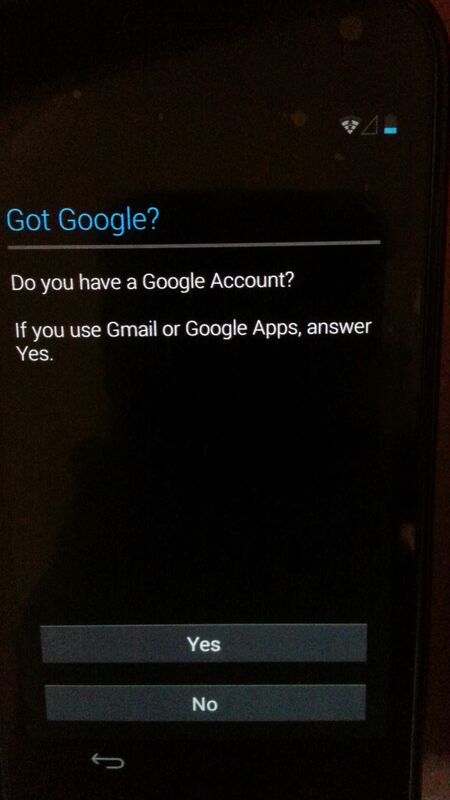 7) Once you’ve setup your network, the device then asks if you have a Google account. It’s a good idea to connect this now as if you have your account set to auto-restore your apps then it will be able to do that straight away. If you do already have an account, select “Yes”, otherwise select “No” and it will walk you through setting up an account. 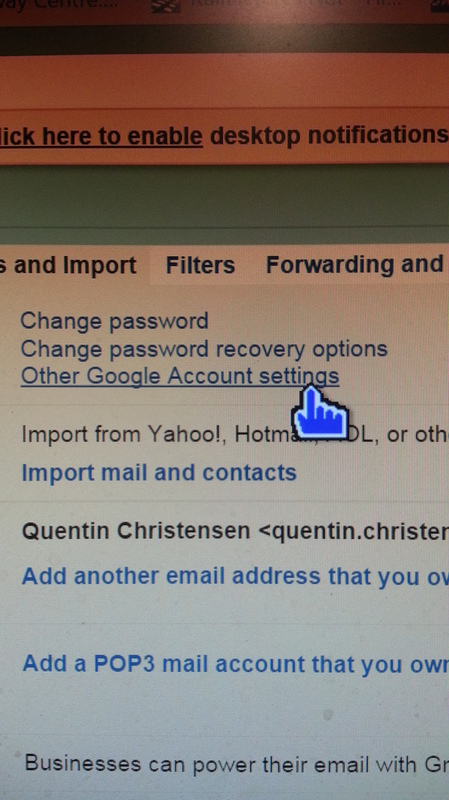 8) If you’ve already got a Google account then it will ask you for your (Google) E-Mail address and password. When entering a password, the letters and characters you press are not displayed on screen, rather a dot appears, just as when you type passwords on a computer. If using Talkback, it will read “Dot” for each character. To hear the actual letters, plug in headphones and Talkback will announce the letters, numbers and characters normally, although still display the dots on screen. 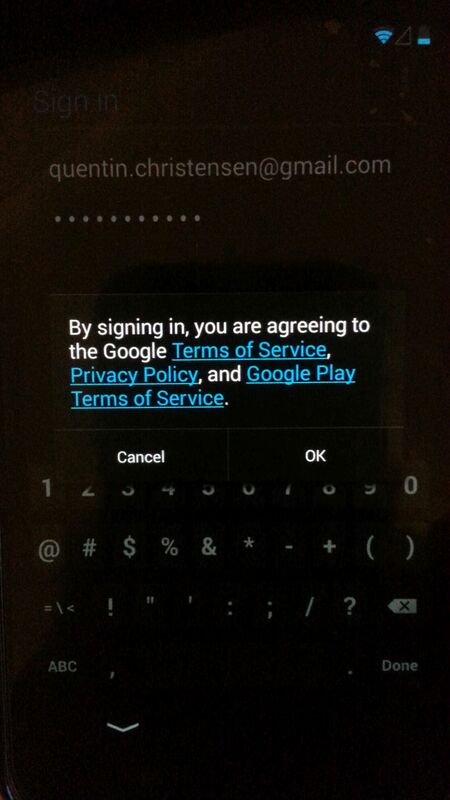 9) The device then gets you to confirm you agree to all the Google terms of service, each of which is a link to open the full terms in your browser if you desire. When you are finished reading, choose “OK”. 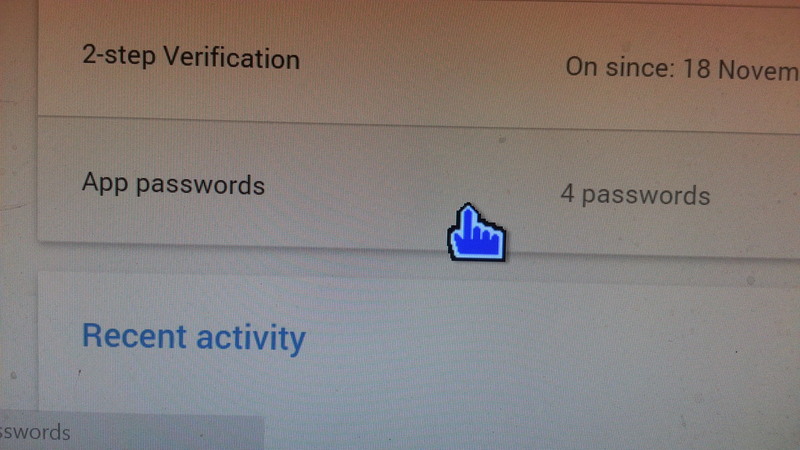 10) If you are using two factor authentication on your Google account (you should be, it’s much more secure), then you will be prompted to log in online. What it will do at that point is send you an SMS and ask for the code. 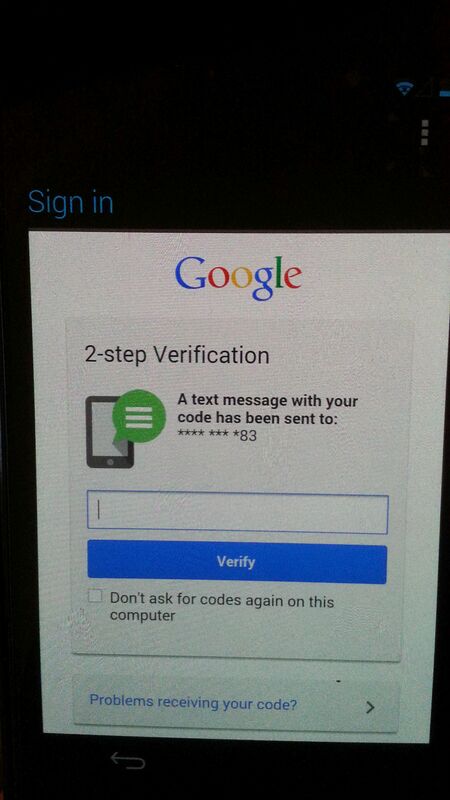 This is problematic if you are setting up your regular phone, as the phone is not yet in a state where it can receive text messages, so you will either need to have Google send the code to an alternate phone (if you have set one up, eg your spouse’s phone), or be sitting at a computer and log into Google on the browser, go to account settings and “app specific passwords” and generate one for your phone. 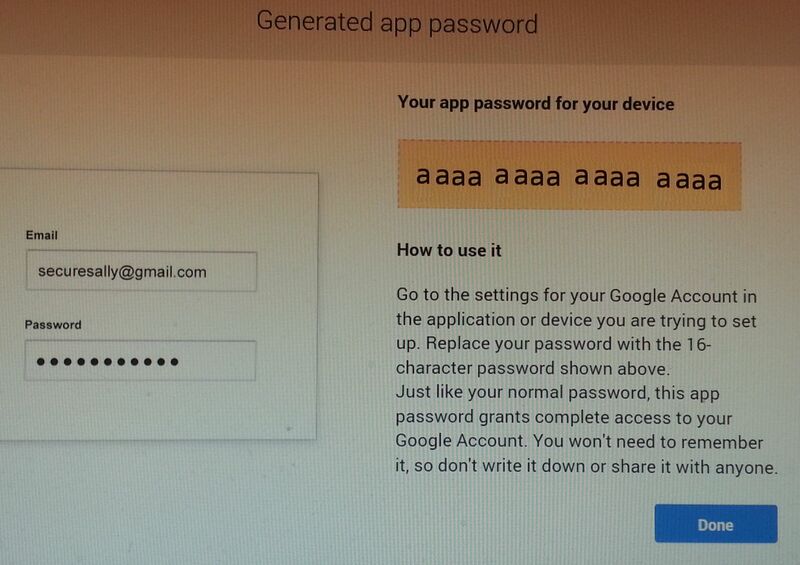 You will then need to enter the 16 letter password which is displayed on your computer screen on your phone. See the images above for examples. If you like the mouse cursor in those images, you can get it from the 22 Point website cursors page. 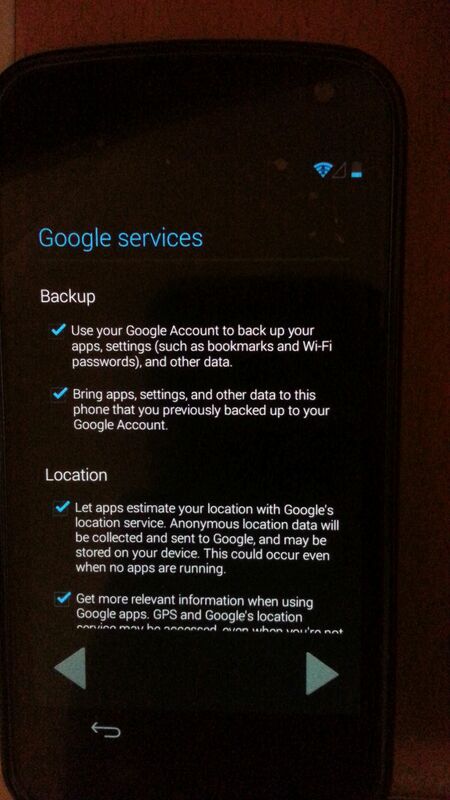 11) Next, you are presented with a screen of account options, including which backup services you would like to use and whether to allow apps to access your location. You can change these later in settings if you wish. The options span more than one screen so you either need to scroll down or press the Next button to view the remainder. Once you are done, press Next. 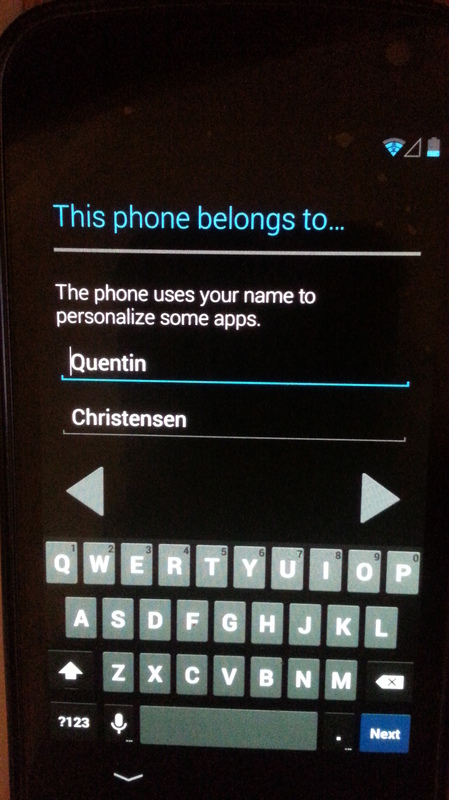 12) The phone then asks for your name so that it can personalise services for you. Enter your first and last name and press Next. 13) You are now advised that setup is complete. When you press OK, the phone will automatically download any apps if your account was setup to do that, and also check for any system updates. – A “status bar” at the top with the time, battery level, Wi-Fi and / or 3G signal level, and icons for any notifications. 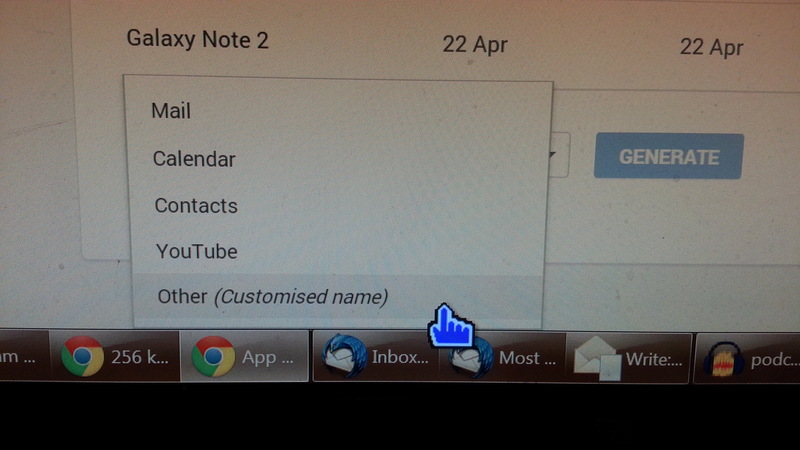 – The bulk of the screen is your “home” screen which can have icons, widgets and folders on it. Icons are small images which when pressed (double tap with Talkback) will launch whichever app is associated with them. Widgets are like ‘live’ icons – they can be bigger than one icon but have information visible which updates regularly. For instance the icon for a weather app might show an image of the sun. The widget for a weather app will tell you what the current temperatue is and possibly have an image of a sun, or clouds or rain depending on the current weather. Folders allow you to store multiple icons in one place. For instance often there is a “Google” folder with icons to many of Google’s apps (Google+, Gmail, Maps and the Play Store for instance). This section is divided up into a grid which depends on the size of your device but may be 4×4 or may be as large as 6×6 or larger. You can have more than one page or screen worth of icons and widgets and you move between them by swiping left or right (with two fingers for Talkback). – The bottom row of icons is usually a “Dock”. This row contains icons to launch apps much like the others, only these do not change as you move from screen to screen. By default there are usually icons for the phone and SMS features on phones, and also an “all apps” icon to take you to a list of every app you have installed, and possibly an icon for the browser, play store or other apps. So that’s a walkthrough of factory resetting and unboxing a device, and also my longest post yet! If you still want more, have a listen to the podcast on this topic and if you still have questions, please ask away in the comments! This Post was tagged accessibility, android, setup, unboxing. Bookmark the permalink.